As the Confederates charged the Union lines on Cemetery Hill General Hancock passed behind his troops, on horseback, to steady them under the horrendous fire they were receiving. As he did so, a minie ball passed through his saddle and embedded itself in his upper thigh near the groin. He was helped down from his horse but refused to leave the field until the outcome was apparent. An aide propped him up against an empty ammunition case and applied a tourniquet to his wound by winding a piece of cloth around a pistol barrel. 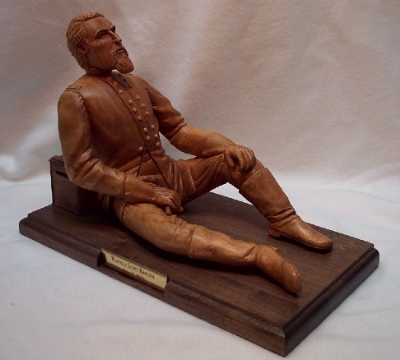 This carving, in Butternut, depicts General Hancock, with the pistol barrel tourniquet around his leg, intently following the battle as it progresses. During the Battle of Gettysburg, as the remnants of Pickett's Charge reached the stone wall near a copse of trees, they were met by the 69th Pennsylvania infantry. 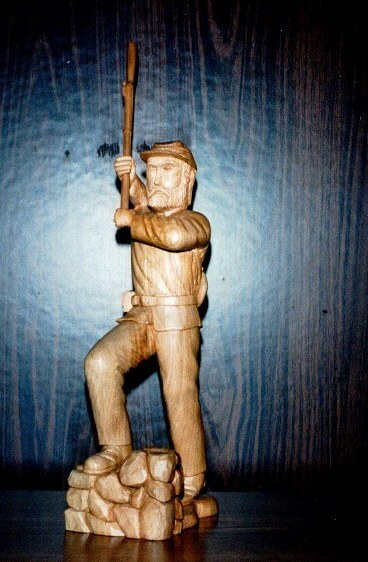 Many of the Pennsylvanians were out of ammunition by that time, and fierce hand to hand fighting ensued. The piece depicts a 69th infantryman with his musket reversed for use as a club as he steps up on the wall to administer a blow.